Planning does not automatically guarantee results but taking action, making changes, choosing to FOLLOW THROUGH from your goal plan WILL equal results. How many of us coast on the natural high generated by formulating a well thought out plan of action to lose weight and include exercise in our daily lives only to find we can easily be derailed by setbacks and a plethora of excuses, failing to follow through on the action needed to succeed? 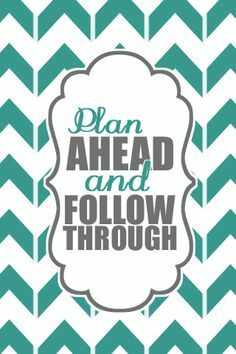 A good well thought out plan of action sets a clear pathway ahead for you to follow to reach your primary goal and all your mini-goals along the way. When you follow through from your plan with changes and committed action, you can evaluate and review along the path what is working for you, what is not working and can make adjustments while still ploughing on ahead doing what you need to do. Sometimes though, having a magnificent workable strategy is absolutely useless if we don’t launch ourselves from the starting blocks and get busy with manifesting into reality what we have intended and planned for ourselves. It can be so easy to remain stuck at the planning stage. It is quite sobering when you realise you have to put the pen down and actually go and take the action required to kick start your planned strategy into life. Here are a few tips to help you launch yourself from the planning platform. Divide your goals into smaller chunks which will lessen your chance of feeling overwhelmed by what’s ahead of you. Focus on one mini-goal at a time, one step at a time. Fear of failure is a good thing. Use fear as a tool to help propel you forward and keep you stretching towards your goals. If you are not scared well then you are not far enough outside your comfort zone to learn and to grow. Fear is your ally. Tumbling and taking falls are to be welcomed. And you WILL fall. Falling down or enduring a setback is a gifted opportunity to reassess and tweak your route to your goal, helping to keep you focused and on track. 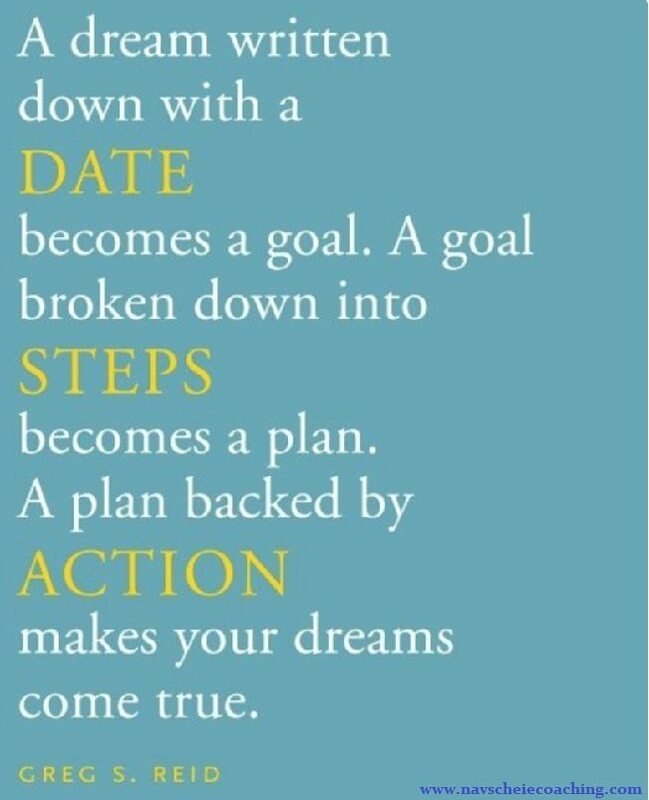 Get back up and follow through. As you choose to reflect on any setbacks, get rid of what is not working or serving you and keep the tools and resources that are helping to guide you with decisive direction to success. Constant committed reflection on your plan helps you to follow through. 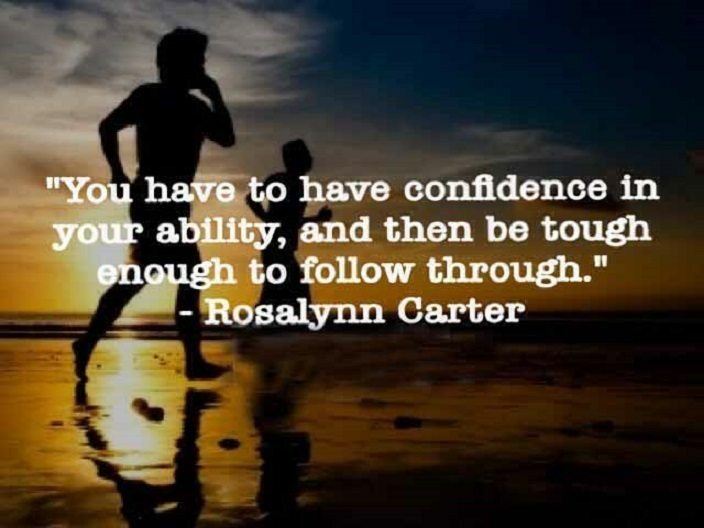 You are learning and strengthening your resolve to realise your goals. Confide and affirm to a trusted person in your circle of influence, what your goals are, why it is important to you to follow through with your own personal plan and what actions you are taking to make your goals a reality. Sharing your goals and action strategy with a close friend, a family member, your coach, or someone who has already achieved what you want to achieve, will help keep you accountable which in turns helps you to measure your progress and keeps you engaged. I have been so invested lately in the natural high and endorphin rush I experience when running that I have been sorely neglecting to follow through with filling in my Food & Exercise Diary properly and staying within my calorie allowance. I’ve been farting around losing and gaining the same 3 or so pounds since Christmas. I need to cop on to myself big time and demand more of what I know I am capable of achieving and stop accepting less of myself. 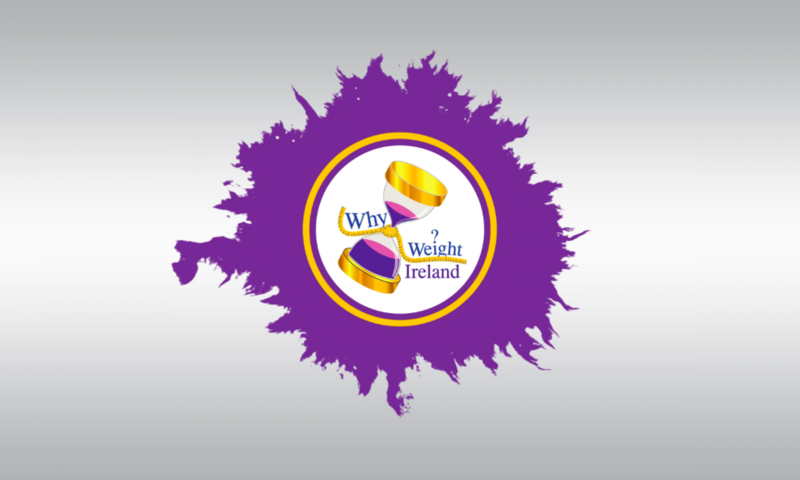 To help me be more accountable and get back on track this week, I am sharing photos of my meals and their calorie content on the secret Why Weight Ireland Community Facebook page with other members and finishing the daily post with a screen shot of my final calorie count. It may sound excessive but for this week I know that this accountability will land me back in the driving seat with determined and focused effort. As they say, you can’t out-exercise a bad diet! I have enjoyed my exercise this week and for someone who was welded to her couch this time last year with not a prayer of a crow bar lifting her out of it, this is massive progress. Read on to find out more about my running progress this past week and suffering an injury already! Monday 1st February – I’d prefer to stay indoors now tonight and snuggle on the couch with my two boys than go out running in the dark under the stars. My eight year old mentioned to me this morning when dropping them to school that he misses me now in the evenings when I’m off running and wonders will I stay at home tonight instead. Ah, talk about pulling at my heart strings! I explained that it’s important that Mammy gets to go do her own things as well during the week and that it’s good for me (and them!) that I get out to exercise and do something that I love. They are so used to seeing Mammy at home that it’s been an adjustment for them these last few weeks for me to leave the house 3 evenings in the week. We all talk and agree that now that every evening is taken up with activities, including my running and their soccer etc that we need to factor in a better timetable to include good quality time together, which includes baking which they love. I rock up to the running track all the same for 6 o’clock and make an effort to enjoy the warm-up session, including the unmerciful squatting with resistance bands. I’m feeling a little obstinate though about running this evening as I think I may have picked up an injury in my knee as have been experiencing sharp shooting pains in one of my knees when coming down the stairs during the day and when stepping up in to the house but not when walking. I’m annoyed with myself for what seems like an injury and feel like packing in the run for tonight as being the stubborn girl that I am, I don’t want to do it at all if I can’t do it right!! I keep myself in check and from abandoning class altogether by choosing to just breathe and give it a go, follow through, and know I can walk it out if I need to. After a long warm-up we head to the track for intervals of (30 seconds hard, 30 seconds recovery) x 20. I gauge my knees as I’m running but all seems okay and I finish with a great pace of 12:13/mi with the mile hit at 12:05 minutes. I am delighted and relieved to have chosen to follow through with the class and think maybe the niggle in my knee maybe isn’t an injury at all as I didn’t feel any twinges when out running. Maybe my body is just tired after running nearly 4 miles on Saturday and then the 5km race on Sunday. Tuesday 2nd February – I’m too tired and contrary to go out and exercise today! Wednesday 3rd February – Nope, it’s not tiredness, there’s definitely a twinge in my right knee so may get it checked out. Running is somewhat slower tonight as I’m afraid of jarring my knee and am so not in form to be on the track. I stick it out all the same, with a slower pace of 13:18/mi. I can’t even begin to describe what the intervals are like tonight as I find it difficult to count them out myself as we keep going with the increasing times so just kept listening for Gary’s whistle. I am cheered to follow through with tonight’s session but am still contrary in myself all the same. Thursday 4th February – I wrestle into my brand new industrial strength sports bra and I tell you, it is an effort trying not to dislocate my shoulders trying to secure myself into it! On arrival to the Youth Centre for Strength & Conditioning Class I write my name down to be seen during class by the Adrenaline Running Club’s Physio, Maria, so I can get my knee looked at. I only remembered at the last minute before leaving the house that I could see Maria so ran back in and barely had time to shave that one leg only and cut the knee off myself 🙂 . Gary demonstrates the exercises for tonight at each of 5 stations and I just want to run for the hills but behave and stay put as, among other things, I want to bring this new sports bra for a spin! There are the usual eye-watering planks, lunges (with kettle-bells tonight!) and floor exercises (also with kettle-bells) but the one that had me freaking out in my mind before I have even tried it is the following…. One person is to wear a large thick resistance band about their waist and run as fast as they can while another person is to hold the resistance band at the other end, pulling them back, like trying to rein in a mad horse. What ensues is hilarious as the bottom area of the hall is turned into a wild horse-breaking arena. The woman I am paired with is a strong runner and is practically dragging me across the floor as hard as I am pulling her back. When it’s my turn at the front, I feel like I am trying to run through treacle with the band on as she has way more strength in pulling me back. I miss one circuit of the exercises as my name is called to see the Physio. It turns out I have Patellofemoral Pain Syndrome, otherwise known as Runner’s Knee. I have never been to a Physio before and by Jesus did it hurt!! I kept tapping my belly and my head to distract myself from the chance of letting a roar out of me. It turns out while I was feeling Olympic the previous weekend with all my running, it wasn’t the wisest decision to follow my Saturday morning run with the club with a 5km race the following day as it was too much of an increase in mileage so early on. Lesson learned. I’m grateful for the session and look forward to doing the exercises that Maria is to send on to me via email. I also realise too late, with horror, that I was a big mucky farmer in hopping up to lie on the bench with my runners still on. Mortified! Saturday 6th February – This morning I choose to be brave and decide to run on the roads with the group instead of staying to run on the track. My mileage is pulled back to 5km for today so I join the 5km group and we check out the route on the map that Gary has provided. Tellingly, we orientate our way around the map route first by checking where all the chippers and Chinese Take-Aways are! I know I am going to be painfully slow in comparison to the others in the group but I so want to get out on that road that I don’t care anymore if even the whole place is being locked up by the time I saunter back. It’s exhilarating to be back out on the road and to be running with other people as well. My knees are holding up well too which is gratifying. It’s not long now before the others leave me for dust but I’m happy out just being out there and following a route. Gasping up Graigue bridge and giving myself a pep talk on how to stay on shuffling up that hill I am delighted with the distraction of someone on the other side roaring my name at me. I look across and there is my friend Jacinta out for a run with a friend so we roar encouragement at each other and just stay going. That interaction gives me potent incentive to keep putting one foot in front of the other. When coming up near the town park I fancy I could nearly slow to a walk, just for a minute or two but kind of know too that if I do, that I may just give in and walk most of the rest of the way. As it happens, I could swear that our running coach comes by in his car and waves and beeps at me so I am well relieved then that I am not nabbed walking, LOL! I spot up ahead another runner so I zone in on him and hope he is from Adrenaline Running Club and keep him on my radar. I haven’t a prayer of passing him or getting near him but if I keep him in my line of vision I can keep my pace steady. My new sports bra is still a novelty and I am well impressed that I no longer am worrying about my chest area and having to constantly pull at bra straps! Soon enough I come across my own Heartbreak Hill that I despised with a passion when I was out running a few years ago but I give it some welly and it isn’t nearly as harrowing as I remembered. I don’t have long to go and feel invigorated that I am still going strong, even though at times it really feels that I am going the wrong way on one of those moving travelator things at the airport. Regardless of the fact that I am last back to the track from the 5km run I don’t give a fiddler’s as I am captivated by my persistence to keep going and finish it. I feel like an epic legend! One of these days I will catch up with the others in the group so it is a compelling challenge to work towards that. As one of the quotes on my Inspiration Wall in my kitchen reads, “Don’t be upset with the results you didn’t get with the work you didn’t do!”, I must wholeheartedly own the 2lbs I have gained this week. I am well out of the starting blocks for the week ahead already with filling in my Food & Exercise Diary and staying within my allowance. I’ve set myself a target weight loss of 3lbs for next Monday so watch this space! 4 stone 1lb down, over 5 stone still to go. On one of my long romantic walks to the fridge this week I behaved well when I got there and came up with this gorgeous, delicious and nutritious lunch which took ages to eat. Full serving as above including the salad is 411 calories. Enjoy! Toast your bread and grill your smoked bacon rasher. 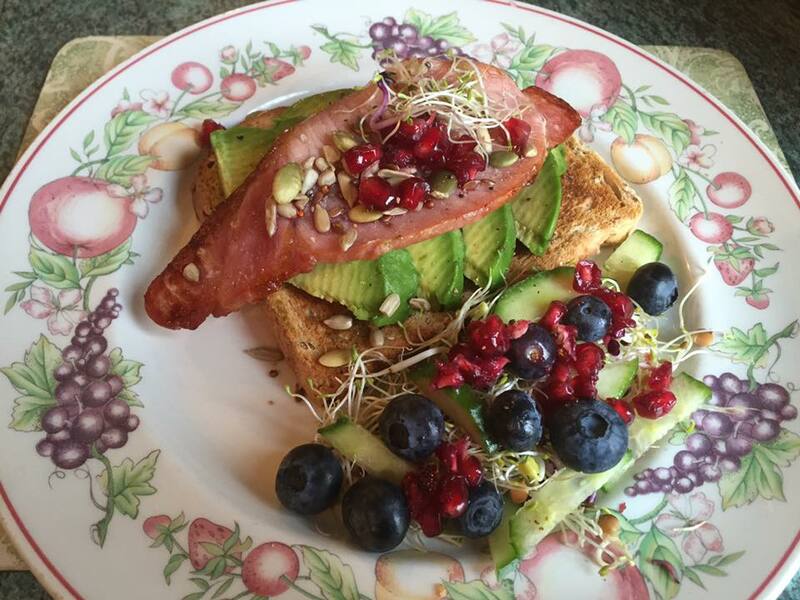 Place the sliced avocado on the toast, top with the bacon and finish with the super seed sprinkles and some pomegranate seeds. Plate up the remaining salad of alfalfa sprouts, cucumber, blueberries and pomegranate seeds.